Leabank Square: What a Perfect Day! You know what was the wierdest thing? When I got back last night, it took me a whole hour to figure out what was different with the green, before I noticed the new borders! Not only does it look ever-so beautiful, there is no clue that it had all been done in a day! You all tidied up so well that it looked like it was done by magic! Thank you to EVERYONE who did this for Leabank Square!! We love you Skanska, oh yes we DO!! Sóna, I am sure you're going to get around to thanking the brilliant people who gave us our new borders, but please make sure that it's on behalf of EVERYONE! I know there were SOME residents who were not too keen to have the very people creating all the dust & noise come over here and create even more dust & noise, but LOOK AT WHAT THEY GAVE US!! In a way, our green is a micro-Olympic site! I was at work, but I imagine that there was some inconvenience during the work, but look at the bigger picture..... loads more tomatoes, pumkins, bean, melons, peas, herbs for the Leabank Square pots! Across the canal, a bit more noise & dust of course, but the bigger picture is the amazing Olympic Park! So don't let Mr & Mrs Grumpy get you down too much, what Skanska did for us was brill! Cheers for the text Gill. They're letting us off an hour earlier because of the strike so I'll meet you on the green for a cuppa! It looks good up on the blog, I can't wait to see it for real. Sóna, how long did it all take? It took you weeks to do the edible garden, it couldn't have taken them just a day to do this? Anyway, add my thanks to the Olympic people will you? I hate to admit it mate, but you all did a magnificent job out there yesterday! As you know, I had my reservations, but it looks one whole lot better. Besides the new borders, I love the new manhole hill. It looks like a feature now, maybe we should put an art instillation on top of it! What happened to the other manhole cover? Bit by bit, Leabank Square is starting to look like a proper well maintained, looked after residential square again, after years of mismanagement, and you deserve a lot of the thanks for that yourself. Sorry I had to rush past, but I was late already, and then had to catch 6 busses to work, but oh! the green looks lovely. I saw it properly from the upstairs window this morning, and it looks so beautiful. There weren't half a lot of you there yesterday weren't there?! I can see why its all done and dusted. Thanks to everyone for making it all so nice. The Green does Look lovely now and thanks to everyone that helped, I can't wait for all the sunflowers & veg etc to come up. However it would be nice if more of the residents would make an effort to help water the plants and keep the square clean. After all the hard work we put in, its a shame that others feel it necessary to destroy what took so long! You all made the green so inviting and enticing now. I love it. I also saw Sóna picking up all the litter this morning. I know it's not too far a walk to the rubbish bag he put out, but some kids seem to think its cool to just drop it on the green. How about writing another one of your famous begging letters to Jules Pipe for a few rubbish bins? But thanks again for all the back-breaking work everyone put in to making the green special again! We ALL appreciate it! It look so much better! I know that you guys are forever in the gardens trying to improve them for all of us, but in one day these skanskas have done much more than you could ever have alone! You should have driven that little digger around the corner and hoped that they forgot it in the Square for us to use! Are they gonna still move the bags of soil & compost next to the stairs? I s'pose we could wheelbarrow the soil into all the pots up on the riverbank, but it would be much easier to do it if they were closer. But HEY, well done EVERYONE. We finally have borders all around the entire green, now we just need to make sure no-one messes it up for Leabank Square! Next - please could you do our two front blocks? I know we have the rails around ours, but Niels has nothing, so people just walk all over that very nice familys beautiful garden on the corner. If we both had borders, then it would be clearly marked out! I'm sure there were a lot more other people involved, but I deffo saw Skanska! It was like a mirror on Wednesday. I looked out of my living room and saw Skanska on the Olympic site. I looked out of my bedroom and saw Skanska in Leabank Square. What did you think of the talent girls? Mmmmmmmm. Specially the ones at the skip whenever they lifted them wheelbarrows in the air! It does look amazing though and im sure it'll just continue to do so in the coming months! Very Impressive! I wish you could have been more charming when you tried to get us Trowbridges to form a similar Community Association. We also have the potential to get the Olympics to do something for us, but no-one speaks to each other over here! Well done with the borders mate, but the riverbank looks like its had lots more work done as well! Was that them as well? Maybe this summer can you come and chat at one of our meetings again, see if we can get some of the newer reisdents interrested? The ODA came through for us huh?! This is what being a good neighbour is all about man! If you're way richer than those next to you, DO SOMETHING for them! Had a cuppa very early this morning on the green, just me and the pigeons! So peaceful and really beautiful, thanks to all involved. Its not that I didn't believe you, its just that I wanted to see it for myself! If they had a truck Take all them concrete balls to opposite Leabank Square, surely they can get a truck to REMOVE them elsewhere and demolish them somewhere out of earshot! Someone my age shouldn't have to be putting up with this racket! Shona, please phone them again and tell them what I said on the phone! Two days is too much! Thanks for calling back, sorry to call you at work, but I NEED some sleep, I'm on again at 6pm! Why right opposite us AGAIN?! Where are the sound barriers? Why can't they use a smaller truck? Why is Goerge making excuses for them? I know they worked hard for all of us last week, but that is no excuse for the noise today! It's rattling all around Leabank, and I'm on ward tonight! Please could you find something out for me? Can I book into a hotel for the day and charge them. It will only be till about 9pm, my shift starts at 10. I desperatly need some kip. Remember the stats from the previous but one meeting? 2 in every 10 Leabank Square resident does shift work of some kind. 20% of the residents need their sleep today, and what happens? The ODA go and drill away at concrete lumps send the most gut-wrenching noise through the entire square! If I am hearing it so loud in block A on the road, I can't imagine what Tom in the front block must be hearing! This is why I warned you about getting into bed with them. 2 minutes after you cycled out this morning, a huge tipper truck and an even larger digger came and collected all the concrete blobs opposite! Was THAT so difficult?! Was it Georgina who lied to you AGAIN(!) about the impossibility of bringing large vehicle into the water mains area? How are we ever going to develope a trusting relationship when there's all this petty bull****ting going on? This is a classic case of them up in their Ivory Towers in Canry Wharf not being anywhere near the disruption, noise and dust we have to endure. They cannot possibly know what is REALLY going on down on the ground! Can they not move to the welfare centre? Then, when we ask to to call them, they can actually see, hear and tatse the same things as you! What use is the community liason team if they are not even based in the community? SOME people need to get focussed again! What the ODA did for us was lovely, we now have more space to grow food, and that's what this thread is about! I agree that we need to talk about the noise and dust again, but on another thread. I want to add MY thanks to the ODA. Have they sent you a list of the partcipants yet? And I agree with Sóna, I think we should defiently invite them to one of our barbies (tho still not that abhorrent Sharpe person!). They were all very committed to giving us great borders, and thats what they did. A good job, excellently done. SOME PEOPLE? Don't change the subject Shanice! Face & the blog at same time? Impressive! No YOU don't change the subject! No YOU don't change the subject! NO YOU DON'T CHANGE THE SUBJECT!! NO YOU DONT' CAHNGE THE SUBJECT! Cuppa tea after we collect the kids? Sóna, as you know I've been away for a couple of weeks, and the transformation is remarkable! It's like a completely different square! From the newly planted (and positioned) planters to all the amzing sunflowers, to the new borders, to the cleaned car-park, to the nursery, to the purple pots, to the shed, to the amazing garden in the first block (Lucy's? ), beautiful pallets, oh too much to mention. So well done to everyone! I need to spend a few days de-briefing, but after that I'll tuck in as well! I'm sorry to say so, but I'm hoping you have some good rain over the next week or so to get all your plants well settled in. Then I hope you have a decent rest of the summer to enjoy them. Owens right - we need to make a rosta to give the plants a good soaking at night. I can do either a Monday or Thursday, anyone else up for putting their name down? I watered again this morning for 3 hours. The hose is in the Square for Everyone to use to water the borders etc. If you don't know how to attach it give me a knock at 89and I'll show anyone where & how, that is willing to water too. I just came over to see Bill and am amazed at the transformation! The planters at the front are going to look spectacular with the sunflowers greeting us. Not too mention the rest of them along all the borders, old and new! Please can you come along and convince Sergei to do the same on Wick? I know we are lucky to have him full time AND paid, but he aint half boring! I saw that reborn nutter having a go at some of you about the amazing gardeners we had in the square from my window! 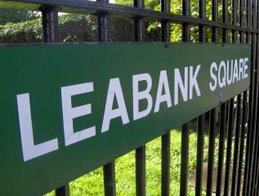 For someone who NEVER contributes a single positive thing to Leabank Square to be so chauvenisticly aggressive to residents who are making Leabank Square a much better place to live in - is a tiny bit rich! This is why he is so popular with the rest of us! Yes, that rude guy was shouting at us that it was our fault his car had been scratched by the ODA! I told him it was impossible as we were all standing and watching the digger & that the digger was nowhere near his car it was in fact on the pavement, (see photos above)! He kept shouting that I should have informed him!? * I told him he was rude and he kept shouting until a man came over and said exactly what I had already said, he then walked off.I can only assume he's a woman hater!! "What a Perfect day . . .
Sona in bed with the ODA . . ."
It almost sounds like a Lou Reed song (except Lou Reed never sold out to "the Man"). What makes me laugh is that Sona doesn't seem to see it (Well, maybe he does, and posing like a plum with the ODA's tools is the best he can do after last year's fiasco). Still, apparently it's because you all need food, and you do need to eat, I guess. ..... a couple of plum trees. Get on their case again will you please Sóna? Yellow Eggs will do nicely. Phil just texted me about those saddos at olympicmonitor. I was wondering how long it would take them to sing the preditable selling out tune. Whats even sadder than a bunch of old geezers playing with & pleasuring each other, is that you seem to be part of their foreplay now! Better watch out next time they gate crash a barbie Sóna! Seems to me that cos they lost the 'olympic' argument, they now desperatly need to find a new enemy, and they found Leabank Square! Whey-heeeeey! Lucky for us huh?! Hey - sad old men...... get a life somewhere else. You know, sometimes I swear there are more people reading this blog than residents! Why do these monitor people think its appropriate to comment on the whole Squares blog and be so personal about Sóna? But because they are a bunch of wannabe virtual guerillas, they can't get their head around a democracy. Who the hell is Loo Reed anyway? Probably another sad old man. Oh Everyone, just completely forget Gamesmonitor, they're an utter irrelevance. What about getting back to thanking the ODA for a great day? They worked so very hard, donated many tools, and left us with amazing borders! Thank you so very much ODA - welcome to Hackney Wick! Have you seen how the plants are thriving in the new borders?! They absolutely love the compost that's what! Thanks to all the Olympic people who helped Leabank. And to all the residents who helped out as well. But especially to the Gardening Club who got such a surprise when they finished school!! Now grow us loads greens kids! The sunflowers are looking so healthy and green! They are going to make such a spectacular display for all of us this summer. Thankyou! here we go again innit? Why did that ozzie start with the lies now? Is there absolutly NO honest person in the ENTIRE olympic community team?! If its emegency work, it is an emergency, not a 4 day long BLOODY LOUD ENGINE left on for THEIR convenience!! Time for plan b methinks! Just get her full name first. Oh yes, isn't this the same dolt who tried to foist them perverts on to us? Whats their excuse this time? An alien landing and randomly turning a water pump on? David higgins checking that the generators are working at 3 in the morning? Seb Coe OCD advance that their are going to be lights at the opening ceremony? I WANT SOME SLEEP!! This bloody generator at the handball arena MUST be sorted out TODAY!! Don't let some ditzy air-head tell you that it's some pump or the other! We all know its the generator - its not as if we cant tell the difference by now! How can they hear the difference all the way from carnary wharf! I am leaving LS now after having had a VERY disruptive sleep, when I get bak in the early hours I expect this to have been SORTED! It sounds like shes trying to lie to Kavuma as well. Talk about sending everyone on a wild goose chase! Why doesn't Kavuma arrange to go on site after midnight to check it out for himself? I'm sure Hackney Council can arrange some overtime for the guy! I don't believe it!! The generator finally ran out of diesel last night!!! At last a peaceful nights sleep!! Now Please Sóna, make them understand that it is DEFINETLY a generator!! Don't let that brainless dumb blond who puts on that 'ever-so-cutsey' helium voice tell you any different! We Know What a generator sounds like after 2 years of suffering under them! !